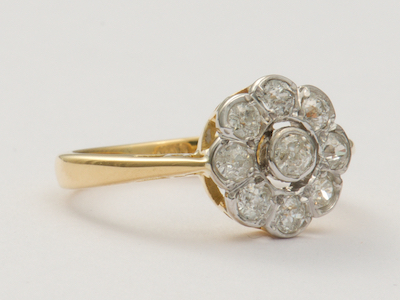 Like morning sunlight on a still pond, this antique engagement ring casts a soft glow. The multi-faceting of the ring's Goshenite gemstone sends shafts of light in every direction. The stone is surrounded by pierced filigree work that extends down the shoulders of the band. 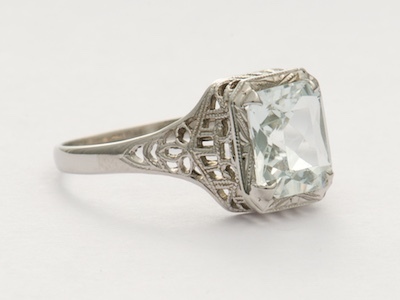 Delicately cradled this way, this antique engagement ring's angularity is subdued. Details: Antique. Art Deco. Circa 1935. 10k white gold. Cut-cornered rectangular scissors cut Goshenite (a colorless aquamarine); 1.51 carats. This vintage style wedding ring's alternating circle and teardrop shapes create geometric interest and provide a flirty scalloped edge. These geometric accents are pinpoint and bezel set with sparkling diamonds that are mille grain trimmed for added texture. Details: New. Vintage Inspired. 18k yellow gold. Round brilliant cut diamonds; 0.25 carats. 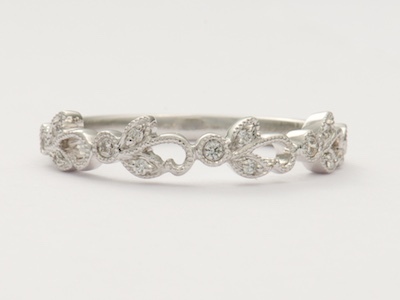 Like climbing ivy, this vintage style wedding ring's diamonds dart in and out, flirting with the delicate scroll work. A white gold setting tonally backdrops this wedding band's flirtatious elements. Details: New. Vintage Inspired. 18k white gold. Round brilliant cut diamonds; 0.42 carats. 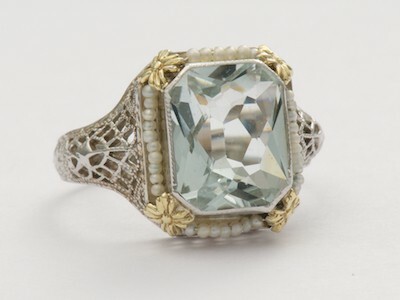 Like gentle ocean waves, this vintage inspired engagement ring undulates across the finger. 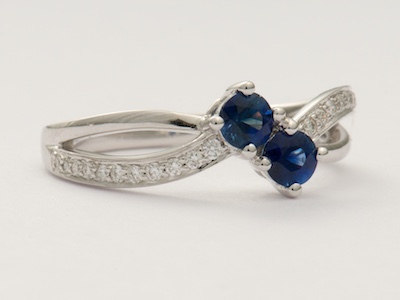 Two blue sapphires are bypass set in this beautiful engagement ring. The split crossover band enhances the wave effect. A collection of twenty-two diamonds cascades down the ripples of the polished band. Details: New. Vintage style. 18k white gold. Round brilliant cut diamonds; 0.14 carats. Blue sapphires; 0.49 carats. 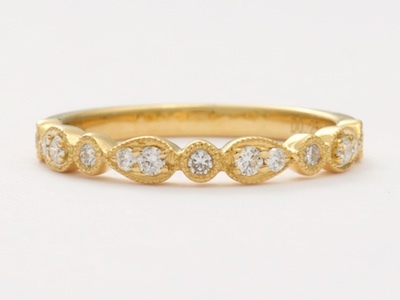 Like morning glories, this vintage inspired wedding ring delicately winds itself around the finger. 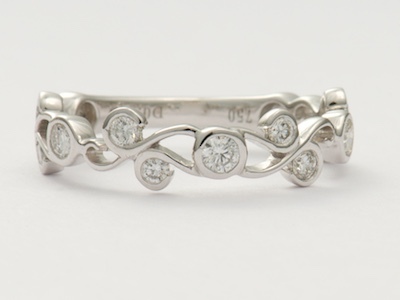 This dainty band is accented by a twisting leaves pattern. The wispy foliage flutters halfway around the band. Diamond accents sit like sparkling dewdrops at the center of each leaf. Details: New. Vintage style. 18k white gold. Round brilliant cut diamonds; 0.09 carats. 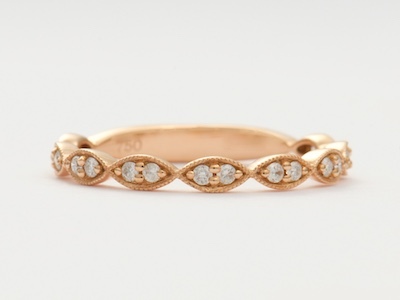 Diamond teardrops dance across this vintage inspired wedding ring. The slim, flirty band is made of romantic rose gold. Adding to the romanticism are teardrop surrounds trimmed in mille grain. A pair of diamond accents is tucked in the center of each teardrop. Details: New. Vintage style. 18k rose gold. Round brilliant cut diamonds; 0.16 carats. A framework of seed pearls and gold flower blooms surrounds this antique engagement ring's aquamarine. The cut corners of the aquamarine add a spark of geometric intrigue. The angularity of the center gemstone is softened by the delicate seed pearls that trim it. Floral touches at the corners offer a splash of femininity. They interestingly contrast with a pierced white gold band. Details: Antique. Circa 1935. 14k white gold. Aquamarine; 2.59 carats. Seed pearls. This antique ring's scarab-carved gemstone is a testament to the sacred ancient Egyptian beetle. The combination of yellow gold and reddish orange adds a warm and inviting glow to the finger. 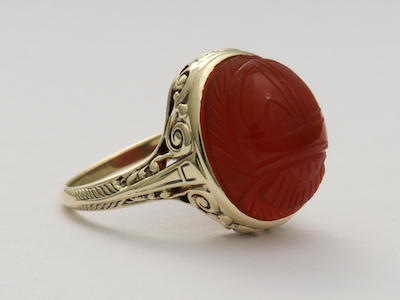 The band is carved with swirls that spotlight the oval cabachon carnelian gemstone at the center. Additional feathery engraving extends down the shoulders of the band. Details: Antique. Circa 1930. 14k yellow gold. Carnelian; 6.99 carats. A diamond accented bowtie gives this vintage style engagement ring a formal affair touch. The diamond at the center is wrapped in a double bow. 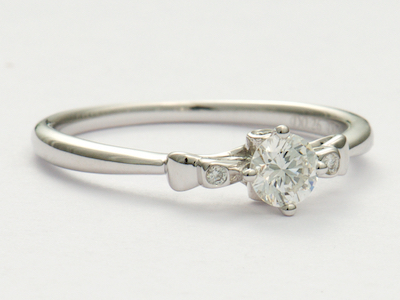 Diamond accents sit at the shank and flank both the center diamond and the end ties of the bow. A slim polished band adds the finishing touch. Details: Vintage style. New. 18k white gold. Round brilliant cut diamonds; 0.26 carats.